We have started the tests with a 1C discharge rate (0.7A) for the 2S 6.6V 700 mAh Zippy Flightmax LiFe battery and we’ve managed to get 653 mAh as a maximum capacity, a value that is a bit shorter than the official rating of the battery of 700 mAh. So the battery should’ve been labeled 650 mAh instead of 700 mAh as apparently it cannot provide 700 mAh at 1C discharge rate, but the interesting thing is that this battery can provide the same capacity with a discharge rate of up to 3C and going to the maximum rating of 5C as a constant discharge rate we are seeing a bit of a decrease in the useable capacity where we got 599 mAh. 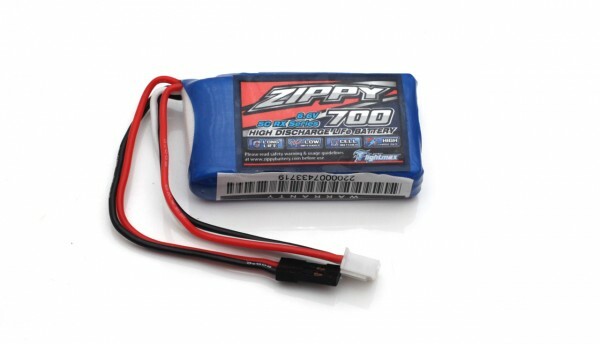 So the discharge rating is Ok, the capacity however is labeled with 50 mAh more than it should’ve been, in the end these batteries are handling pretty well, so if a 650 mAh LiFePo4 battery is what you need at a good price, then you might consider getting these Zippy Flightmax batteries. What you should have in mind here as well as with other small batteries that use thin cables passing higher current such as 10A (the burst load rating of this battery) or even higher as a constant load is not a good idea as they will get hot and may melt and short the battery, and that is definitely something you don’t want!